For my second dropping, a 12" MGM LP which I bought sealed some years ago on eBay but only opened the other day, as it's just the sort of thing to fling out of my cave-mouth. 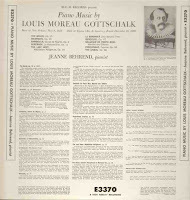 I can't now remember when I was first turned on to Gottschalk - perhaps it was by Georges Rabol's Opus 111 CD back in the early 1990s. Then I read S. Frederick Starr's fine biography Bamboula! and later bought Jeanne Behrend's edition of Gottschalk's Notes of a Pianist - one of the funniest and most endearing memoirs that I have ever read, the kind (like Samuel Pepys's diary) that makes the difference in centuries seem irrelevant. Starr highly recommends Behrend's pioneering 1956 MGM disc, surely the first all-Gottschalk LP, as one of the best. Well, I just had to have it! Having now listened to it, I can't say Behrend's playing is the subtlest I've heard but it has spirit, conviction, authority, drama and a great sense of the pieces' shape. 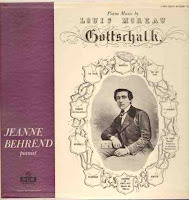 Behrend had previously recorded a recital of early American piano solos, including one by Gottschalk, for Allegro; these remained her only LPs, though she also made 78s, including a set of Saint-Saëns' Carnaval des animaux with Stokowski. Of course, one important purpose of this uploading exercise is to let you decide - do you agree with Starr? Does this LP and thousands like it deserve its present oblivion? As before, no processing other than ClickRepair and monoing. Track titles and other info in FLAC tags. The order of the pieces as listed on the back cover is not the order in which they're presented on the disc and in my dub! What's track 2 on side 1? I can identify the rest, but I'm not familiar with this, and the cover art won't enlarge into anything readable. I read Gottschalk's book fairly recently, and I must agree that it's highly enjoyable to read his opinions on travel, people, accomodations, and everything. What a grueling life he led. It's such a shame we lost him so early. I can identify The Banjo, Bamboula, Le Mancenillier, Berceuse, Le Bananier, Pasquinade, March des Gibaros, The Last Hope, and The Union. What is the remaining piece? And thanks for this great recording. My gratitude was somehow edited out of my post when I was in the process of writing it! Thanks, G! I'll update my tags. We had an exciting New Year -- the power was off all day. To convert a FLAC, I have to convert to WAV and then to MP3, and by then, they're all "Track 01" or some such. Your offerings are much appreciated anyway, and I'm heading for the lute record after I hit 'send.' Best wishes to you too! Wow, I've been searching for Jeanne Behrend recordings for a while. Awesome! Thanks for uploading these. Here it is the complete LP dates!!! !